Then dubbed Project Sword, Epic Games' Infinity Blade had as grand an unveiling as any iOS game could ever hope for—an introduction from Steve Jobs himself. It's finally available, and, in short, it was definitely worth the hype. Perhaps unlike Rage HD, the former holder of the looks-so-good-I-can't-believe-it's-on-my-iPhone title, Infinity Blade has truly amazing 3D graphics and a compelling game behind them. While it's not necessary the full RPG experience that it might've seemed like back at the Apple event, Infinity Blade, basically a gesture-based fantasy combat game, is without a doubt one of the most impressive games in the App Store. After some stock fantasy epic setup, you jump right into the action. Tapping your way along a predetermined path up to an ancient castle—you can look around at each stop (very pretty!) but can't move on your own—you encounter all sorts of sword-wielding beasts which you learn to slice, dodge, stun and parry. Different opponents require different timings of the various maneuvers, and while slashing away at your opponent can get a little button-mashy, avoiding their attacks takes precise control. There isn't a huge deal of variation from fight to fight, but the combat dynamic is fresh, difficult, and engaging. The more you fight throughout your quest, the more experience you gain, allowing you to buy new weapons and new armor along the way. 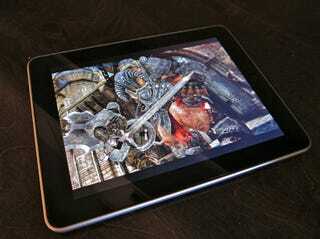 But all that is in some ways secondary to what's really so remarkable about Infinity Blade: its graphics. It's the first game built on Epic's Unreal engine (available soon to all iOS devs) and, like the Epic Citadel demo before it, it's stunning. Shading, lighting, shadow—all of these things look as nuanced as they ever have on iOS, creeping ever closer to console quality. It also shows in the movement of the characters, and in turn in how closely the protagonist responds to your gestures. Blocking attackers' blows requires swiping your finger in the same direction they're swinging, and to actually keep them from hitting you you have to really be swiping in the same direction. It's tough, but it's enjoyably responsive.